What does peanut oil have in common with other polyunsaturated vegetable oils like soybean oil, safflower oil, and sunflower oil? 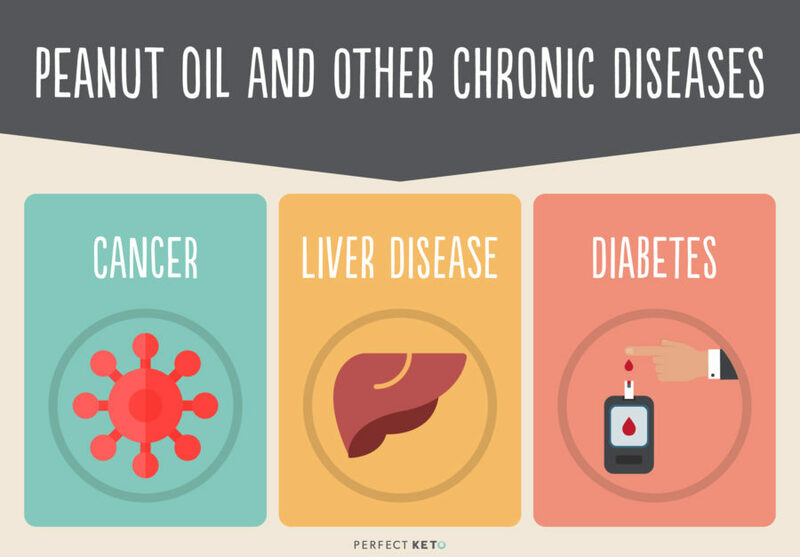 All of these cooking oils have a couple of things in common: they’re touted by the American Heart Association (AHA) as heart-healthy options … and current science doesn’t support any of their claims. Read on to get the details about peanut oil — backed by science — so you can make the right decision for your health when it comes to cooking oil and getting more healthy fats into your diet. Peanut oil comes from the peanut plant. The peanut is crushed and the oil is pressed from the legume. Then the oil is served unrefined or processed further to make refined peanut oil. 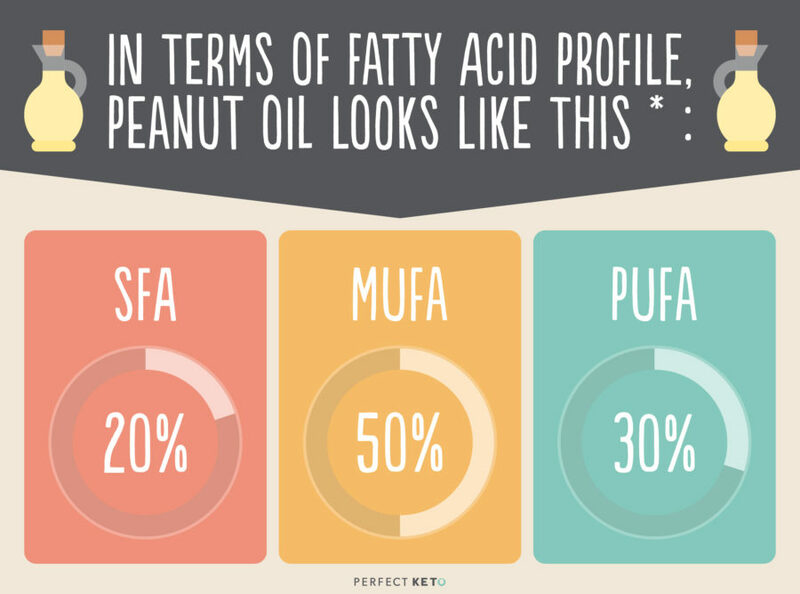 High in MUFAs and PUFAs and low in SFAs, peanut oil is the kind of fat the AHA recommends to reduce heart disease risk. Unfortunately, recent science doesn’t support this recommendation. Some say peanut oil is healthy because it contains vitamin E. Vitamin E is an antioxidant that helps battle free radicals and reduce oxidative stress. But there are a couple of problems with peanut oil that negate its vitamin E content. First, peanut oil oxidizes when you heat it, which creates more free radicals. Second, it’s rich in omega-6 fatty acids, which throws off your omega-3 to omega-6 fatty acid ratio. You want your ratios to be about 1:1 omega-6s to omega-3s or 4:1 at the very least. The standard American diet provides most people with a ratio more like 20:1[*]. As a result, obesity has skyrocketed — and along with it chronic diseases like diabetes, heart disease, and cancer[*]. These two things — omega-6 content and high rates of oxidation — make peanut oil high in free radicals, which cause oxidative stress. Oxidative stress — fueled by reactive oxygen species (ROS) — are linked to pretty much every chronic disease in the book[*]. If you’re looking for more vitamin E-rich fats, opt for palm oil or avocados oil. A deeper dive into that last reason now. Saturated and monounsaturated fats, thanks to the strength of their hydrogen bonds, tend to be heat stable. But not all fats hold up to heat. Take peanut oil. Peanut oil contains the omega-6 PUFA linoleic acid. When you expose linoleic acid to high temperatures — like when you fry it — those lipids oxidize. You’ve smelled oxidized lipids before. Rancid food is oxidized. Old vegetable oils sitting in the back of your cupboard are oxidized. And these oxidized lipids are highly atherogenic. In other words, they cause heart disease. How does this work? Once digested, oxidized lipids often glom onto lipoproteins — the particles that carry cholesterol throughout your blood. And when a low-density lipoprotein (LDL) carries oxidized lipids, that LDL particle is more likely to become oxidized too. Oxidized LDL, unfortunately, is more likely to penetrate your arterial wall and cause an inflammatory immune response. And this is how atherosclerotic plaques develop. But that’s not all. Once consumed, oxidized lipids also interact with free radicals in your bloodstream to create even more inflammation[*]. This inflammatory cascade contributes to heart disease and obesity. There are several paths to obesity — a high carb diet being one of them[*] — but a major contributing factor to the obesity epidemic is a high-PUFA diet. Polyunsaturated fats like linoleic acid raise your omega-6 to omega-3 ratio, which increases your risk of obesity[*]. Another omega-6 PUFA, arachidonic acid, can also cause obesity. And nothing raises arachidonic acid levels like consuming linoleic acid[*]. Americans eat a lot of linoleic acid. You can find it in soybean oil, canola oil, sunflower oil, and peanut oil. And it’s a major driver of the obesity epidemic[*]. In one rodent study, two groups of mice were given one of two diets: high linoleic and low linoleic. After 14 weeks, the high linoleic “modern American mice” became obese[*]. There’s clinical evidence too. For eight weeks, researchers added peanut oil to the daily smoothie of both lean and overweight people. By the end, both groups had gained weight[*]. So no, eating high-linoleic peanut oil will not help you lose weight. And it won’t help you avoid disease. In addition to heart disease and obesity, there are many other diseases linked to high-linoleic veggie oils like peanut oil. Here are three. Eating high linoleic oils — especially when they’re oxidized — is a surefire way to increase oxidative stress. This oxidative damage — and the associated inflammation — can eventually transform normal cells into cancer cells. Then tumors start to form[*]. More and more Americans are developing a condition called non-alcoholic fatty liver disease (NAFLD). Fat builds up in the liver, which causes a number of issues, from abdominal swelling to full-on liver cirrhosis[*]. How does NAFLD develop? Many factors: high-carb diets, metabolic syndrome, and yes: vegetable oils[*]. Eating extra virgin olive oil, on the other hand, appears to improve liver health[*]. Type 2 diabetes presents as obesity, insulin resistance, and hyperinsulinemia. High-carb diets cause diabetes. Low carb ketogenic diets may reverse it[*]. High linoleic vegetable oils are also linked to type 2 diabetes[*]. So, how can you avoid toxic oils and choose the right fats for your salads and stir-frys? Read on for some practical tips. Peanut oil may have a delicious nutty flavor. Unrefined, cold-pressed peanut oil may even have some healthy vitamin E. But it’s also easily oxidized, which means it can throw off your O6:03 ratio and contribute to conditions like heart disease, metabolic disease, and obesity. Peanut oil and other vegetable oils are sold as “heat-stable” oils, but they actually oxidize easily at high heat. Instead, choose more stable cooking oils — saturated and monounsaturated fats like coconut oil, butter, palm oil, and avocado oil. The lipids won’t oxidize, and they’re delicious. Many restaurants — especially those serving Asian-style cuisine — use peanut oil to fry food. It tastes good. But it’s not worth the damage. 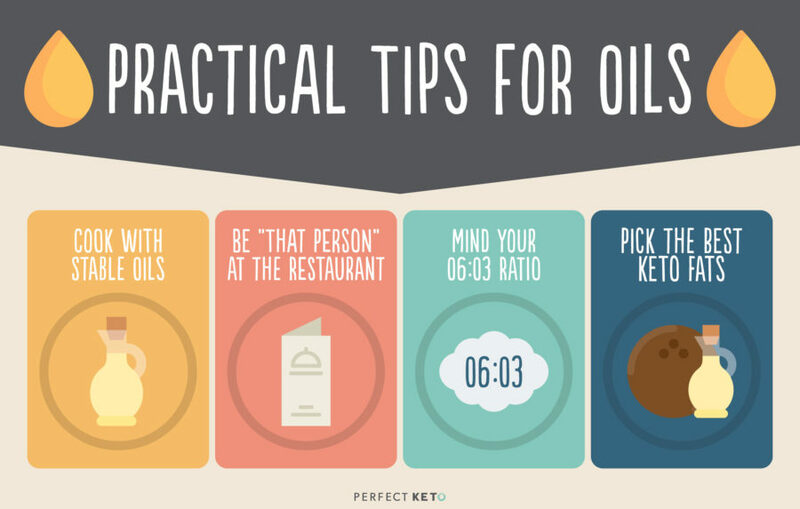 Ask if the chef can use a healthier cooking oil, like olive oil, butter, or ghee. Eating less O6 fats — peanut oil, soybean oil, safflower oil, etc. Even if your ratio isn’t 1:1, 2:1 or 3:1 is still better than most. Whether you’re on a ketogenic diet or not, it’s still a good idea to choose healthy “keto” fats. Peanut oil may be delicious, but that distinctive nutty flavor comes at the cost of your health. Cooking with peanut oil generates oxidized lipids — molecules known to cause heart disease. And eating peanut oil means eating linoleic acid — a PUFA that spikes your O6:03 ratio. All things considered, one thing is clear: the AHA was wrong about polyunsaturated fat. It should not be a dietary staple. Instead, always opt for healthy fats. 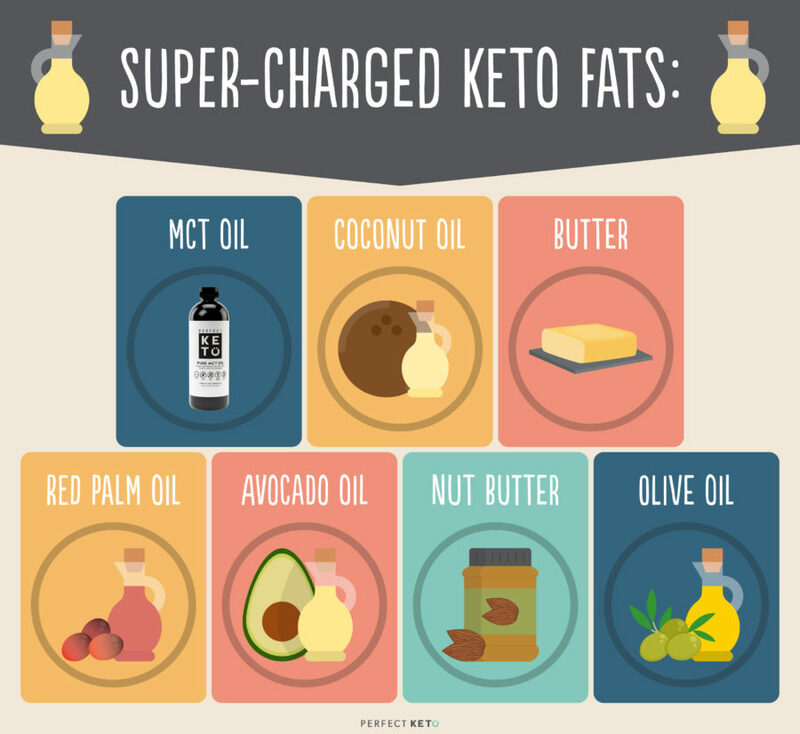 These fats support balanced hormones and neurotransmitter production, plus they’re part of a healthy keto diet. 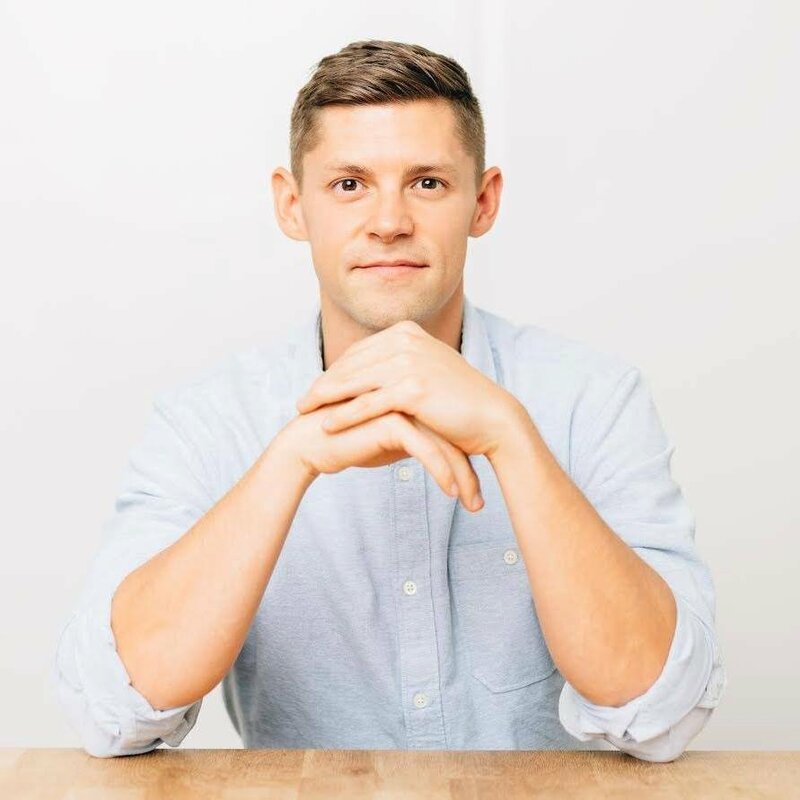 Want to learn more about keto? Start here.